We’ll be updating this blog post for the next 10 days leading up to Giving Tuesday. Follow Red Cross on Facebook and Twitter, as well as this post here! Inspired by university students carrying their belongings in pillowcases during the aftermath of Hurricane Katrina, The Pillowcase Project is a free emergency preparedness program developed by the Red Cross for 3rd to 5th graders. Interactive lessons focus on three principles: learn, practice and share. Students are taught about home fire prevention and safety, and other potential hazards such as tornadoes, hurricanes and earthquakes. Since the 2013 pilot launched, more than 300,000 young students have participated in the program. Learn more at redcross.org/prepare. Kids can also learn about disaster preparedness through the Red Cross app Monster Guard, which can be downloaded from the Apple App Store or Google Play Store, or by texting “MONSTER” to 90999. Two years after Typhoon Haiyan struck the Philippines, families and neighborhoods are healthier, safer and better prepared for future storms and emergencies. Ten thousand families are now living in safer shelter, and more than 10,000 households have received cash grants to help them restart businesses or create new income-generating opportunities. To learn more, visit redcross.org/Haiyan. This month, 10 members of the Red Cross National Youth Council came together at the St. Louis Area Chapter to recap the past year and to plan for 2016. 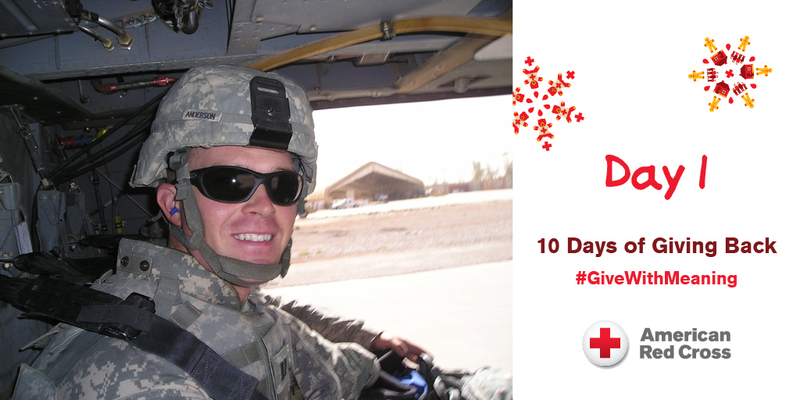 Here, they give 10 reasons why they love the Red Cross. If you’d like to share as well, we’d love to hear from you! Simply use the hashtag #GiveWithMeaning. It’s been another busy year across the country and around the world for American Red Cross volunteers as they have answered the call to help those in need time and again. Whether providing disaster relief, serving military families, helping at blood drives, providing lifesaving training, or helping communities get disaster prepared, it is the heart and selflessness of volunteers that make it happen and get the work done! Read a few stories of our volunteers near and far. The holidays are a time for families to come together for old traditions, favorite recipes and comfort food. There’s a big act of service in preparing a holiday meal. Serving a favorite meal to someone else shows them how much you care. There’s also a big act of service in donating blood or platelets. Along with our celebrity chef partners, we would like to say thank you. When you come to donate at a Red Cross blood drive from Nov. 25 to Nov. 29, you’ll receive recipes, courtesy of John Besh, Richard Blais, Rocco DiSpirito, Mike Isabella, Ellie Krieger and Ali Larter, along with a limited-edition holiday serving spoon (while supplies last). Your donation and gift of time means so much to so many this holiday season. Book your appointment by downloading the free Red Cross Blood Donor App, visiting http://rcblood.org/thanksgiving or calling 1-800-RED CROSS (1-800-733-2767). When 19-year-old Anson Lemmer went on a routine pizza delivery run, his Red Cross babysitter training was far from his mind. But that delivery turned into a chance for Anson to save a stranger’s life using the CPR skills he learned from the Red Cross. His unforgettable quote – “I left a pizza boy and returned a pizza man” leaves us applauding, and wondering: Who is the next Anson? You could end up saving the life of someone you love dearly – or the life of a total stranger. Find Red Cross courses available in your area. Welcome! We’re glad you’re here. In the spirit of #GiveWithMeaning, we’re counting down the stories that inspired us, humbled us and make us proud to be Red Crossers. Watch this special video to learn more about the 10 Days of Giving Back. We support you to here to comment. thanks for sharing and if i would like to participate in this compaign how can i approach. I am very thankful that I was able to donate blood two months ago. It was my first time I am very proud of myself on how I was able to give that blood in 2015.